Personally I like it that Garibaldi doesn't wait until there is someone breathing down his neck before making his ultimatum. It gives me a lot more respect for him. He isn't doing it because he's scared, he's doing it cause he knows Sheridan has crossed a line. To be honest, I don't think Garibaldi was worried about himself at all, he was attempting to jerk Sheridan back to reality with his threat for his own sake. Last edited by Karajorma; August 7th 18 at 20:43. Well my thoughts on why the "10 hour" timing seems off is that it seems like Garbaldi would come up with reasons to hold someone for ten hours. That just seems like something Garbaldi would have no trouble in doing if he felt there was a valid reason to hold the person even if there wasn't a valid reason in the given evidence. If he suspected someone of something it seems like Garbaldi wouldn't hit the panic button on releasing them until more than ten hours had passed. But my debate is pointless. I just didn't like the wording the script at that moment. It doesn't taint my views of the episode in the slightest. I agree that bending/breaking rules to hold someone would be a Garibaldi thing to do, if he suspected that there was something fishy about this guy. The fact that he doesn't want to do it, I suppose illustrates that at this point really no one is seeing the fishiness (other than Vir, clearly ), and Sheridan is just doing this based on pretty much nothing at all. I just watched this episode again. It's almost the year 2019 and just for the first time I noticed the parallels between Sheridan questioning Morden and Knight II interrogating Sinclair in "And the Sky Full of Stars." The difference of course is that Sinclair legitimately didn't remember what had happened to him, and wasn't, in fact, a secret agent for an alien government. Morden actually IS such an agent, though Sheridan isn't questioning him because he suspects him of being one. 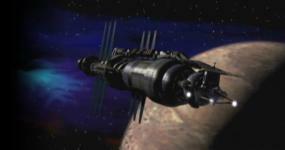 I love that I can still discover new stuff every time I watch Babylon 5!